Joe Arpaio, the defiant Arizona sheriff known for his immigration crackdowns launched an investigation into Barack Obama’s birth-certificate in 2011, in response to a complaint by the Surprise, Arizona Tea Party. He created a five-person, volunteer “Cold Case Posse” consisting of two former law enforcement officers, two retired attorneys, and retired New Jersey police detective Michael Zullo. Now Arpaio faces hearings beginning Tuesday over whether he should be held in contempt of court for disobeying a judge’s orders in a racial profiling case. Nearly two years ago, a federal judge concluded Arpaio’s officers had systematically racially profiled Latinos in the sheriff’s regular traffic and immigration patrols. Arpaio vigorously disputes the finding, but he was ordered to make changes. U.S. District Judge Murray Snow has grown frustrated with the sheriff’s office for failing to abide by his decisions, mischaracterizing his ruling and carrying out inadequate investigations into wrongdoing by Arpaio’s signature immigrant smuggling squad. As those frustrations mounted, the judge ordered this week’s contempt hearing. The contempt case differs from others against Arpaio. The judge has made it clear that the sheriff, whose past legal bills and settlements have been picked up by taxpayers, will have to pay a fine out of his own pocket to atone for his acknowledged violations. Other punishments could come into play, too. County taxpayers have paid $6.8 million in attorneys’ fees, and the county also has forked over $2.6 million to pay a staff that is monitoring the sheriff on behalf of the judge. Taxpayers also are picking up the costs of video cameras in patrol vehicles and the creation of a fund to compensate people harmed by the violation of the 2011 order that barred Arpaio’s immigration patrols. It is notable that there has been no update on the Sheriff’s birth certificate investigation since the announcement it was a fraud in 2012. Although there have been hints (in 2014) that he is close to establishing who was responsible for the forgery, nothing further has been declared.. 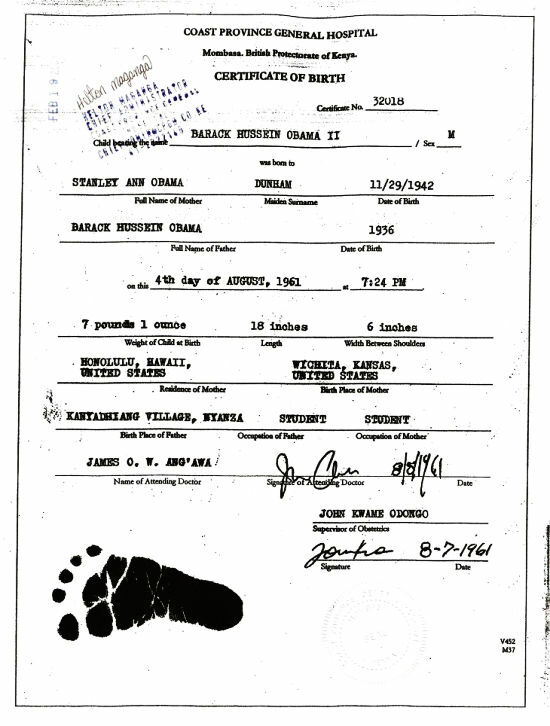 The “Kenyan birth certificate” that you display on this page is one of the three FORGED “Kenyan birth certificates” (I wonder what motivates birthers to keep forging “Kenyan birth certificates”—probably the same motive behind their constantly repeated lie that Obama’s birth certificate is forged.) In any case, Obama was not born in Kenya, and it is nutty to think that there was even a rational chance that he was born in Kenya. On page 77, the same report shows the number of people who WENT to Kenya in that year, and that shows that only 63 did (of whom 60 were Americans), and that of the 63 not a single person, not one, went by air. They ALL went by ship. So, according to birther theory, Obama’s mother, in the last two months of pregnancy at the age of 18, was among the 60 Americans who went to Kenya by sea in fiscal 1961 and one of the seven Americans who came to the USA from Kenya in fiscal 1961, and again she traveled by sea (since no Americans came to the USA from Kenya by air. Moreover, the Kenyan government has said that it investigated and that Obama was NOT born in Kenya. Moreover, the officials of BOTH parties in Hawaii have repeatedly confirmed that they sent the short form and long form birth certificates to Obama and that every single fact on the copy that the White House put online is exactly the same as on what they sent him. Even when he has himself stated Kenya was his birth place and refuses to release records that might contradict his later denials. Go away troll. I’m done with your lies. Your boy is a fake, a fraud and a congenital liar let alone the worst POTUS that has ever been elected. He may not be the real Manchurian candidate but he’s doing a damn good imitation. He deserves to be hung for treason and every day this race baiting communist subversive remains in office he does more damage to US security and its economy and its society. As to his “refusing to release.” He DID release his short form and long form birth certificates from Hawaii, and the officials of BOTH parties in Hawaii have repeatedly confirmed that they sent them to him and that ALL the facts on the copy the White House put online are exactly the same as on what they sent to him. Turning back to the “born in Kenya” lunacy. Okay, so the facts show that it was virtually impossible for Obama’s mother to have gone to Kenya and come back from Kenya with a child. But that is not all. The Kenyan government has said that Obama was not born in Kenya. And, as noted, the officials of BOTH parties in Hawaii have repeatedly confirmed ALL the facts on Obama’s birth certificate. I’m not talking about forged videos, for I know they’re forged. I am talking about Obama’s own biographies and newspaper interviews he gave before it was important that he was born in the US. They’re not forged, they have come from the horse’s mouth. I also know that Obama has set up a division of paid trolls to patrol the web and counter any truth that might be written about his place of birth and it wouldn’t surprise me if you were one of them. Why else would you care so much? All Obama has to do to neutralise a lot of the speculation about his birthplace is release the paper version of the BC for forensic analysis and release all of the sealed records from his past. He won’t do either of those things. Why not? Because he’s a fake and a fraud. The facts on Obama’s short form and long firm birth certificates have been repeatedly confirmed by the officials of BOTH parties in Hawaii, and by the Index Data, and by the birth notices sent to the Hawaii newspapers in 1961 by the DOH of Hawaii. Once again, you have been MISLEAD by birther sites. Obama never said any such thing. BIRTHER sites lied and said that he said it. That’s right, the claim that OBAMA was the author of that biography that birther claim (falsely) was either in or on the cover of his book is false. It is a LIE. Birthers are willing to lie—and a few highly gullible people fall for it. In this case, YOU. Notice what you did. You saw links to many articles and documents showing that the officials in Hawaii of BOTH parties confirmed all the facts on Obama’s Hawaii birth certificate, and you saw the links to the Index Data file and the links to the birth notices in the Hawaii newspapers that were sent to those papers by the DOH of Hawaii. All of them are proof that Obama was born in Hawaii. But you chose to believe a birther lie that Obama had said that he was born in Kenya. Well, it was a lie. He didn’t say it. And, you know, if had said it, IT STILL WOULD NOT BE TRUE. Birth certificates and official confirmations are facts. People can lie and be mistaken about their place of birth. HOWEVER, in this case both Obama and the birth certificate and all the confirmations all say that he was born IN HAWAII. Moreover, the chance that he was born in Kenya is absurdly low. (3) Obama’s relative would have had to have gotten the officials in Hawaii to record his birth in Hawaii despite (as birthers claim) his being born in another country and somehow got the teacher who wrote home to her father, named Stanley, about the birth in Hawaii of a child to a woman named Stanley to lie (and since the woman’s father’s name really was Stanley, Obama’s relatives would have had to have found one of the very few women in Hawaii with fathers of that name to do it). In short, Obama was neither born in Kenya nor did he say that he was born in Kenya. In fact, he said right in his book “Dreams from My Father” that he was born in Kapiolani Hospital in Hawaii. Search on this site for Abercrombie for other posts on this issue. Re: “Abercrombie admits” link. Nope. He never said it. That also was made up by birther sites, along with the three forged “Kenyan birth certificates” and the claim that Obama’s Kenyan step-grandmother said he was born in Kenya (she said he was born in Hawaii in three interviews) and the forged videos and the claim that Obama’s lawyer had “admitted that Obama’s birth certificate was forged” and that Obama became a citizen of Indonesia and that you had to be a citizen of Indonesia to go to public school in Indonesia and that Obama had forged his selective service card (he did not even publish it, a birther did). Obama’s birth in Hawaii is shown by: (1) his Hawaii birth certificate and (2) the confirmation of the facts on Obama’s birth certificate by the officials of BOTH parties in Hawaii and (3) the birth notices sent to the 1961 Hawaii newspapers by the DOH of Hawaii (and only the DOH could send birth notices to that section of the newspapers, and it only did so for births in Hawaii) and (4) the letter that the Hawaii school teacher wrote home to her father, named Stanley, after being told of the birth in Kapiolani Hospital of a child to a woman named Stanley. Moreover, birthers have not even shown that Obama’s mother had a PASSPORT in 1961—-and it would be highly unlikely that she did since so few 18-year-olds did at the time, And even fewer women traveled abroad in the last few months of pregnancy due to the risk of stillbirths in those days. And Obama has spent millions keeping his college records sealed because he was such a dazzling student, too. NO, he never spent one single penny. (Do you only read birther sites?) He simply did not publish his college records. Why should he have, since Mitt Romney and John McCain did not publish theirs (or for that matter Clinton or Bush41 or Reagan or Carter or Ford or Nixon, etc. etc.) And the fact is that NONE of them are “sealed”—Obama’s or Romney’s or Carter’s or any of them. None of them are “sealed.” All of them are covered under the normal state and federal privacy laws. In short, the “spent millions keeping his college records sealed” comment is just another birther LIE.